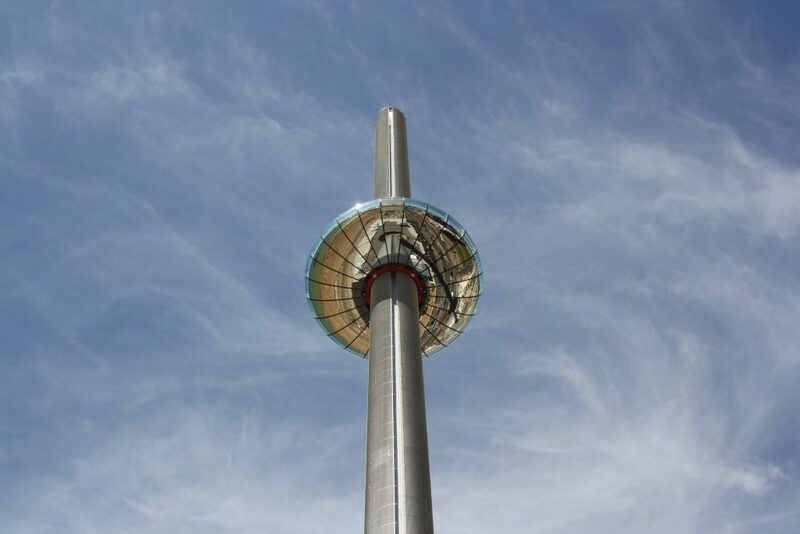 In many ways, going up the i360 in Brighton, or the world’s tallest moving observation tower, is akin to flying. The whole experience is heavily mediated by the idea of air travel, visitors are greeted onto their ‘flight’ by British Airways staff acting as if to take you on a faraway journey, and indeed the view itself is something achieved only by an impressively high vantage point. i360 architects David Marks and Julia Barfield, creators of the world-renowned London Eye, have managed to deliver an experience so awe-inspiring it leaves you craving for more than your afforded 20-minute slot. The i360 might have taken a total of 12 years to conceive, but there’s a sense that it’s here to stay, and will ascend to the front stage of successful 21st century British landmarks. My visit was blessed with clear blue skies and sunshine, allowing for almost unhindered maximum visibility if it wasn’t for the masses of camera-wielding tourists. The weather conditions were almost too good, as the harsh sunlight created glaring reflections in every attempted snapshot. Perhaps the experience would be more enjoyable if there was less pressure to cram in as many photos from every possible angle, and more time to observe the smoothly shifting landscape. Aside from being a stunning work of modern architecture and design, the i360’s main selling point is the unparalleled outlook onto the whole of Brighton and its surroundings- including the South Downs national park, the English Channel, and (apparently) on a clear day, the tip of the Isle of Wight. Designed so that you can barely feel it move, the i360 glides smoothly to a height of 138 metres, before pausing for a few minutes and descending back to ground level. The sheer variety of natural and constructed scenes possible from the i360 entirely justify building it in Brighton, as few other places combine so stunningly elements of natural and urban life. 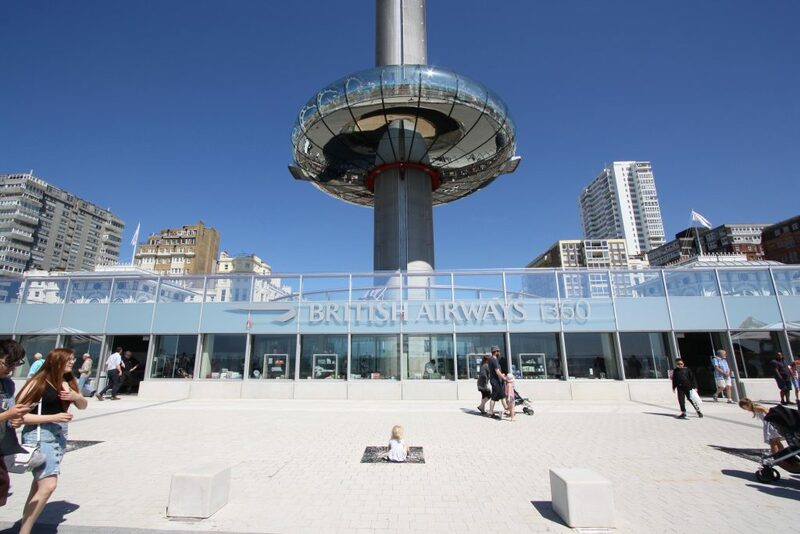 Ten times the size of a London Eye pod, the i360 feels massive yet secure, and combines extreme height with a tangibly smooth journey that has the potential to cure a fear of heights. However, the i360’s journey to where it is now did not come without its problems, and any visit to Brighton makes evident why. Famous for its Victorian and Regency-era buildings, Brighton has a distinct architectural identity and along with it being a historic seaside tourist destination, there is a quintessentially English character to the city. Along comes the i360: a massive, daunting, futuristic lollipop plonked right onto prime Brighton seafront. 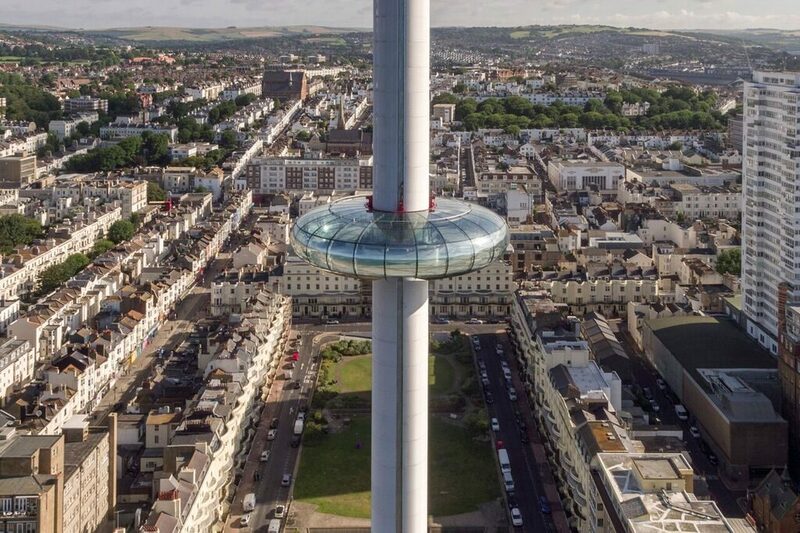 Before being built, the i360 faced considerable backlash from the local community, many complaints focusing on its garish inability to blend into the surrounding atmosphere. Indeed the London Eye fits more comfortably in a modern metropolis already cosy with the idea of tall glass skyscrapers, whereas in Brighton, the i360 is the only thing like it for miles. 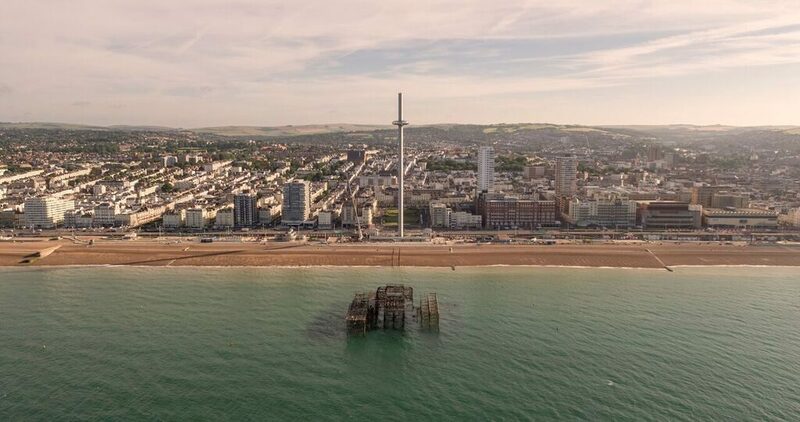 Although it attracts controversy and continues to play a visually prominent role on an otherwise relatively homogenous Brighton seafront, the i360 has already made its mark in the worlds of architecture, design and tourism. Whether it stands the test of time and continues to attract tourists throughout England’s rainier seasons remains to be seen.